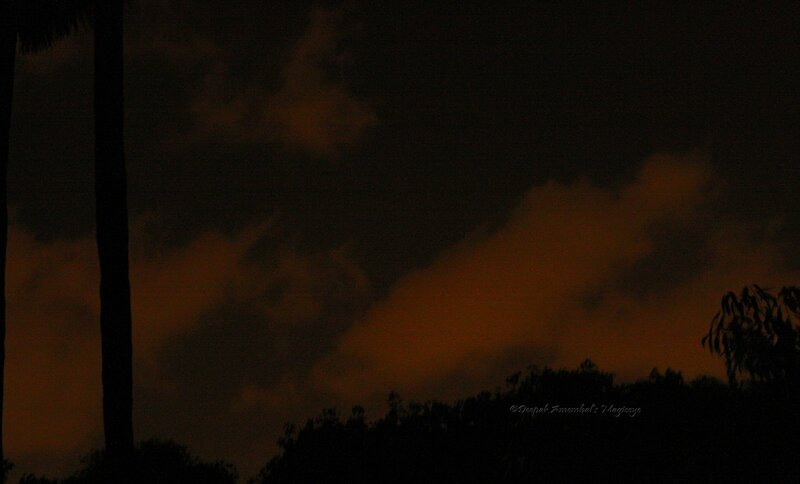 The Mumbai sky as seen on 21apr10 at 6:42pm. Faces of happy children enjoying the annual celebrations of the Sai Baba temple in Vakola, Mumbai. On the roof bonding in Vakola, Mumbai. Saw this father and son beating the heat by spending some quality time on the roof of their house. Dancers dancing to the beats in a procession to celebrate the anniversary of a 'Sai Baba' temple in Vakola, Mumbai. Resting awhile in the Mahim Nature Park. Addiction to barbecued meats and veggies is a given when you dine at 'Barbecue Nation' in Bandra. The Mumbai sky as seen on 21apr10 at 6:39pm. Food for cattle at the Aarey milk colony in Goregaon, Mumbai. Next to the cyclist who is doing his bit for a greener earth, there is the guy carrying pots of water for his daily use. This is a scene from the Aarey Milk colony in Goregaon, Mumbai. The rear story of water buffaloes in the Aarey milk colony in Goregaon, Mumbai. The idol of Sai Baba is covered with flowers as it is taken in a palanquin for the annual celebration of the Sai Baba temple in Vakola, Mumbai. Shirdi Sai Baba was an Indian guru, yogi and fakir who is regarded by his Hindu and Muslim followers as a saint. The name 'Sai Baba' is a combination of Persian and Indian origin; Sāī (Sa'ih) is the Persian term for "well learned" or "knowledgeable", usually attributed to Islamic ascetics, whereas Baba (honorific) is a word meaning "father; grandfather; old man; sir" used in Indo-Aryan languages. The appellative thus refers to Sai Baba as being a "holy father" or "saintly father"
Sai Baba remains a very popular saint and is worshipped by people around the world. The Mumbai sky as seen on 11apr10 at 7:22am. Shades of Green in the Aarey milk colony in Goregaon, Mumbai. Misty Morning ride in the Mini Cyclothon in Mumbai! 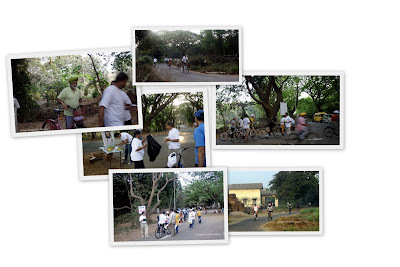 There is a strong wave of the ‘Go Green’ movement that is spreading in Mumbai. When the Road Traffic authorities and the motorists are tearing their hair at the road boggling increase of cars, there is a quiet movement of ‘back to cycling’ that is taking root. And popularising it is an organisation in the suburbs called ‘Mahakali Cyclists Association’. On 11th April morning was the inaugural run or cycle of their 1st ‘Mini Cyclothon’ in the verdant Aarey Milk Colony in Goregaon. There were 85 participants from ages 9 to 70! All of them were there to assert their commitment for a better, greener tomorrow. And yes, there were the pedal hard cyclists too, who were rewarded for their prowess, with medals. Volunteers from the ‘Art of Living’ foundation under the aegis of Sri Sri RaviShankar had set up a ‘Watering Station’ for the participants, where they gave away water and bananas to all the riders to help them on their way to finish riding the distance of 25kms. A Sunday Morning at the Aarey Milk Colony in Goregaon, Mumbai. Paired for life under gray Mumbai skies! A view from top in the Hinduja Hospital, Mahim, of vertical palms and the columns supporting the walkway connecting the 2 sections of the hospital. The Mumbai sky as seen on 01Apr10 at 6:34pm. A flamingo in the Sewri mudflats gorging on algae that will make him pink. A very popular shopping stop in Bandra for shopaholics. Flight from darkness in Mumbai at dusk.